Letter of 20 February from the Parish Council to the Forestry Commission expressing their disappointment that illegal tree-felling had taken place in the parish. We are hoping that this is the start of the Friends of Latchmore and Hyde Parish Council being able to work together to protect Latchmore Brook. Letter of 5 February 2013 to Bill Dow drawing the attention of the Parish Council to the unlicensed tree-felling at Latchmore Brook and asking for their comments. Letter of 24 July to Bill Dow asking the Parish Council yet again to consider withdrawing its unqualified support for the Latchmore project. 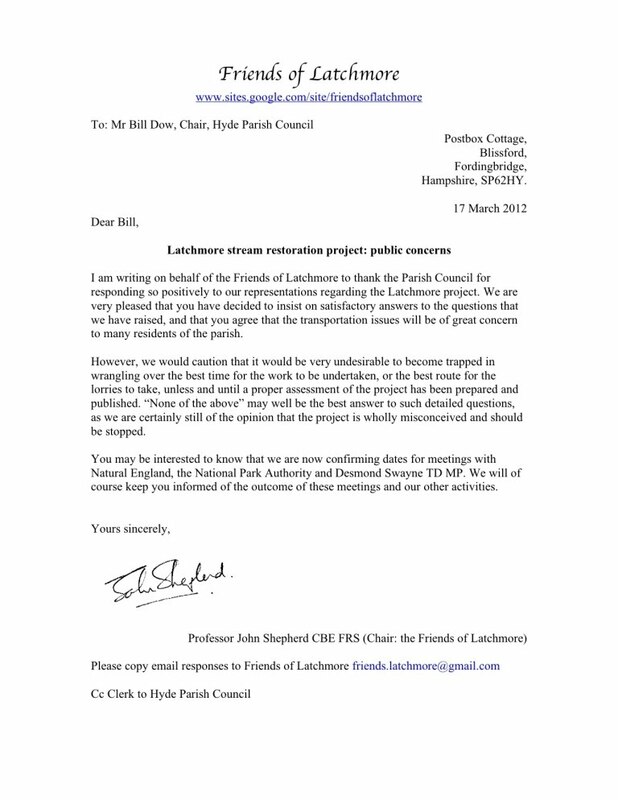 Letter of 6 May to Bill Dow (Chair of Hyde PC) requesting suspension of Parish Council support for the project. Several Friends of Latchmore attended the meeting of the Hyde Parish Council on 14 March 2012. The Friends were keen to ensure that Parish Councillors were aware of their concerns, and wanted to understand the reasons why the Parish Council have given their support to the project without having seen a site specific Environmental Impact Assessment. A letter of 17 March was subsequently sent to the Parish Council.